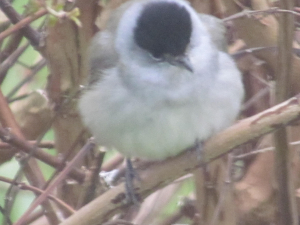 Observation - Blackcap in my garden - UK and Ireland. Description: This Blackcap was fluffing up his feathers. He spent a lot of time in a Fuchsia plant before venturing onto the feeders.Taken through glass. This Blackcap was fluffing up his feathers. He spent a lot of time in a Fuchsia plant before venturing onto the feeders.Taken through glass.